We have a new look. Please see our new home page. This module will focus on three high value innovation methodologies for about an hour each, followed by an exercise. Since the early 1980s, three innovation methods have stood the test of time. Top managers can influence a good deal. Having some taste of certain categories of enabling tools is certain to improve your understanding of the influences and outcomes these tools may create. First Key Innovation Technique - Genrich Altshuller's "TRIZ"
The "Theory Of Inventive Problem Solving [TRIZ]" is a generally useful hard and quantative tool that covers the gamut from "incremental to breakthrough" innovation. Triz may be the tool that has the single best chance of regularly generating new intellectual property that needs to be protected and/or registered. Second Key Innovation Technique - Eric VonHippel's "Lead User Analysis"
Lead User Analysis is a generally useful soft tool when "breakthrough" innovation or "next generation" innovation is needed. Exercise #2: A real time exercise will be conducted to identify possible lead users and lead user sources for a project that one of the participants is currently working on or considering. All Summit attendees will be asked to contribute to the discussion and apply VonHippel's principles to help one or two of your fellow Summit participants identify the lead users for their project. .
Third Key Innovation Technique - Edward DeBono's "Lateral Thinking®" and "Six Hats®"
Six Hatsï¿½ and Lateral Thinkingï¿½ are extremely flexible soft tools that can be adapted to address any level of innovation that one seeks for a particular product or project. 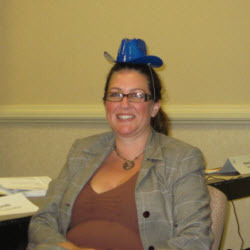 Exercise #3: This module will conclude with a formal group exercise to try out Edward DeBono's "Six Hatsï¿½" trademarked methodology. 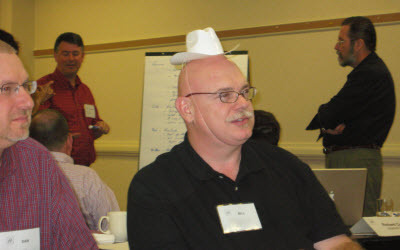 Each "hat" requires a different thinking perspective when addressing an innovation opportunity. Pat Carlisle, a certified trainer of DeBono methodologies, will facilitate this exercise. Two Innovation Summit 7 participants took it to the next level and tried on two of the Six Hats for this rare photo opportunity! The goal of this module is familiarize all attendees with the capabilities of three of the most credible innovation methodologies based on their thirty-year lasting power in industry. Copyright © 1996-2019 __ Goldense Group, Inc. __ All Rights Reserved.